Last week I heard clinical psychologist, author, and independent school guru Rob Evans speak about the challenges of our society and what schools can do to mitigate them. Much of what he espoused was the need for our communities to reclaim civil discourse. With his typical wit and wisdom, he proclaimed that increasingly in our society, "when we do not agree, we stop talking to each other and start talking about each other." Whether it is about political themes around the midterms, societal themes influencing our news cycle, or even exchanges that can happen in our families and school hallways, his message rings true. The challenge as we re-connect and re-create this Thanksgiving is how do we move forward? At St. Anne's we are constantly seeking ways to ask students to listen well, to consider the perspective of the other, and to respect the differences that emerge. Whether it is in the ways we resolve conflicts in Kindergarten with an "I to I," debate the most effective President in 7th grade U.S. History, or study world religions in third and eighth grades, we seek to build community by finding common ground and respecting opposing viewpoints. "We in Episcopal schools hold to a belief that human beings are complex creatures, operating at many levels... Our tendency to divide people or groups into good or bad categories, 'us vs. them' frameworks, does the mystery of humanity—a humanity made in the image of God—no justice. By their nature, human beings deserve more. Just as we often do in the classroom, or in our conversations with students, we strive to slow down the rush to judgment, the simplistic categorizing of people or ideas. In the process, we temper many 'made-up minds,' as we invite others to take a second look." "The good news is that most of us are part of the solution as well. Most of us admire and want to be the teacher who reaches out to the lonely boy (or girl). Most of us mentor and serve people unlike ourselves… It's easier to destroy trust than to build it, so the rippers have an advantage. But there are many more weavers, people who yearn to live in loving relationships and trusting communities." As we consider how we can all become "weavers" and not "rippers," I invite us to consider this prayer by Robert Louis Stevenson, which he wrote in the 1890's while living on the island of Samoa, expressing his gratitude for all of the blessings before him and his extended family. How can we help to improve the discourse in our homes and communities? This holiday season we can challenge ourselves to build up one another, to purge "the lurking grudge," and to see the light of God in each other. The faculty and staff of St. Anne's wish you a very happy Thanksgiving, full of a sense of gratitude, a spirit of community, and a commitment to being "loyal and loving one to another." On Monday, October 15 we begin our five-week Heart, Mind & Spirit parent campaign which helps to support the important work of our teachers and the deep, joyful learning of our students. It is my hope that you will choose to make a difference for the children of St. Anne’s by accepting my invitation to participate in our fall campaign at the level that is most meaningful to you and your family. This year our goal is 100% participation from all of our families. By showing your support during the Heart, Mind & Spirit campaign you will send a very powerful message: that you care deeply about our school and our community. 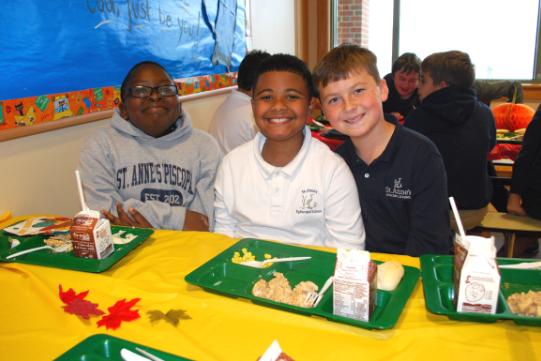 Your participation is important to other donors who want to see that we all share a commitment to St. Anne's success. 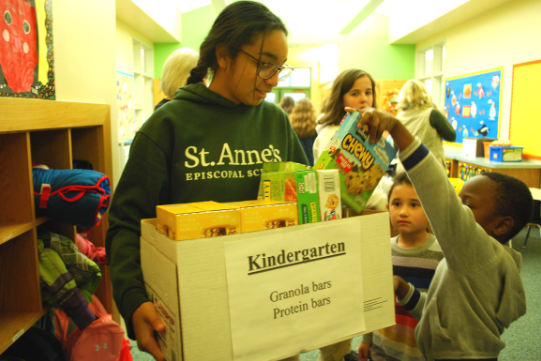 And because we value equity at St. Anne's, every family will be asked to contribute to the extent they are able. St. Anne's is filled with great teachers who give their heart and soul each day to make a difference for their students. Our students understand that they are known and loved at the same time that they are being stretched and inspired by the high expectations set for them by their teachers. I see it every day. You and your support can make all this growth possible. On behalf of our entire St. Anne’s community, I thank you! As students and parents came up the sidewalk on opening day, a team of faculty greeted our students with music, good cheer, and welcome back signs that faculty and students had created. It was heartwarming to see the joy on the faces of the children and the grown-ups. 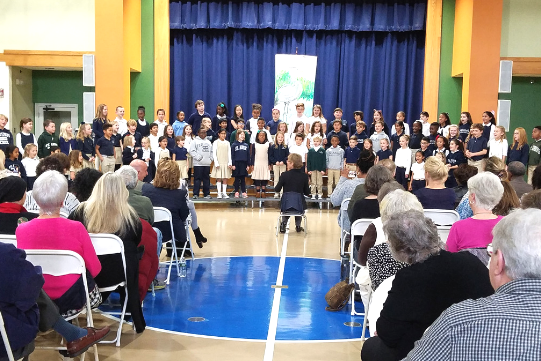 Later at chapel with grades 2-8 we enjoyed some songs, prayers, a gospel lesson, and I invited our students to think about the lesson of the Good Shepherd and our theme for the year: Serving With Compassion. In John's gospel about the Good Shepherd, Jesus wanted his followers to be known and well-tended, just as a good shepherd takes care of his or her sheep, and just as God takes care of all of us. We all want to be known and cared for. We all want to know that those who are guiding us and caring for us can be trusted to keep our best interests at heart. Our teachers have been working hard this past summer to discern how they can best tend their "flock,"how they can come to know their students better and show them just how much they care for them and their learning. Our chapel discussion of the lesson of the Good Shepherd led to a conversation about compassion, one of our core tenets, and what it means to "serve with compassion," which is our theme for the year. We need to be willing to go beyond empathy to act on our feelings of connection to ask, "How can I serve you?" In this, our 17th year, as we go forward as a community we want to remember the image of Jesus as the Good Shepherd who knew his followers, and knew what he needed to do to keep them safe and well cared for. I invite all of us to think more about how we too can be good shepherds and serve others with compassion this school year.